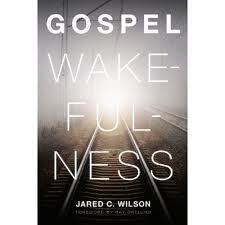 Gospel Wakefulness, by Jared Wilson, is one of the most transforming books I have read this year. telling stories to demonstrate applications of their point. Gospel Wakefulness was different. I couldn’t read it in in one sitting. It touched the passions of my heart. Gospel Wakefulness gave me words to describe my own relationship with Christ. Jared’s book gave me a new way to describe the profound depth of my relationship with Christ. Gospel wakefulness is an experience that is hard to describe. Thus there are no 10 Steps to Gospel Wakefulness. In my own case, I became a Christian in the late 80s. However, in the late 90s, I walked through a period of spiritual brokenness that awakened in me a profound appreciation of the gospel. What happened to me in the late 90s was not a new spiritual rebirth, but a warp speed hyperleap in the depth of my wonder at the gospel and what Jesus did for me. My lips quivered in awe. Tears of gratitude spontaneously formed. Words were impossible to describe the wonder. The closest parallel experience I can think of is when I stood in the shadows of the Andes mountains in Peru, or of the Rockies outside of Aspen. You might have felt something similar standing on the edge of the Grand Canyon. In such a place, I sat in profound silence at the majesty of it all. Nothing is capable of explaining the wonder of the view in front of my eyes. That wordless wondering in the majestic beauty before me is a parallel to what happened to me in the late 90s when I faced the full force of the reality of what Jesus did, not only for me, but for the nations that God intends to gather (Revelation 7:9). Where obedience is out of gratitude, rather than duty. Where worship is out of wonder, not out of Sunday habit. Where spiritual disciplines are out of the overflow, rather than requirement. Gospel Wakefulness is a book that God is using to stir those affections once again. Gospel wakefulness is book that God has used to deepen once again my relationship with God. “The divinely entertained heart of gospel wakefulness finds itself day dreaming about the gospel more “naturally.” This “autopilot” gospel centrality is the result of gospel wakefulness itself.” (p. 63). Order your copy of Gospel Wakefulness from Amazon. (Affiliate Link). Note: The publisher provided me a copy for review.